Kent State University announces its enrollment figures every year, around this time. And since our ministry is so closely tied in with the University, I always hope to catch the news to learn more about the demographics of our mission field. Fortunately, I checked the Akron Beacon Journal this morning and saw their article on Kent State enrollment. 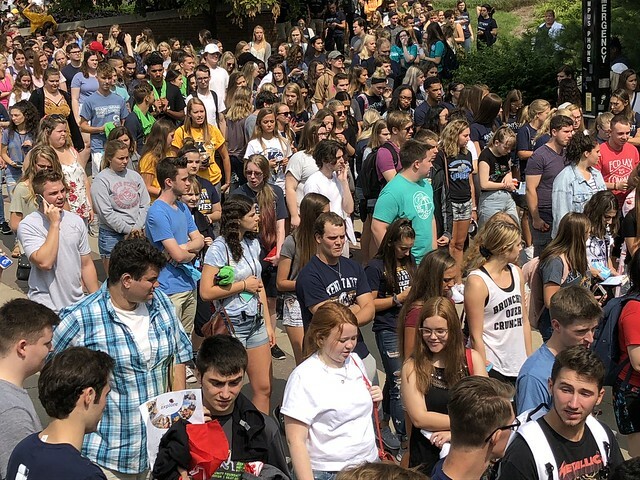 Total enrollment at the Kent campus is 27,143 (There are a total of 38,323 students in the entire Kent State system, factoring in branch campuses). International student enrollment has dropped pretty significantly, down to 1,659. Speculations on the reasons for this include increasing competition for the students from universities in other countries, the U.S. political climate, and cuts in government spending from other countries sending their students to study abroad. The incoming freshmen class set a new record with 4,363 students. Some statistics seem to suggest that Kent State University is drawing a more academically-rigorous crowd, with higher high school grade point averages (3.4), higher ACT test score averages (23.5), more credits earned prior to college enrollment (half of the incoming freshmen class has already banked 16 credit hours before setting foot on campus), and higher college graduation rates (double the figures that the University had in the year 2000, and particularly improving in the area of “underrepresented” students from low-income backgrounds or first-generation students). I’m not really surprised by any of these figures. I’ve been feeling (and getting discouraged by) the dip in international enrollment for a couple of years now. I’ve noticed (and been encouraged by) students coming in with varying levels of academic standing, such as first-semester sophomores, and generally studying harder. Regardless of the numbers, I love Kent State University — and I’m proud to be a part of the campus community. This entry was posted in H2O Kent, Kent, Recommended Reading. Bookmark the permalink.